Powerline networking is a way to extend your network using the electrical outlets in your house. This works by adding a powerline adapter to your network. Setting up a powerline network requires a set of powerline adapters plugged into each electrical outlet where the network extension is needed. The Linksys PLWK400 consists of the PLE400 Powerline 1-port Fast Ethernet and PLW400 Powerline AV Wireless Network Extender that lets you easily set up a powerline network in your home. To learn more about the PLE400, click here. To learn more about the PLW400, click here. This article will guide you on how to create a network using your powerline adapters. • Make sure you already have Internet access and a working home network. • Make sure that the wireless devices that you want to connect to the PLW400 have a working wireless feature. An easy way to test this is to first try to connect it to your wireless router. Creating a basic powerline network is now made possible using your plug and play powerline adapters. This setup assumes that all the devices are located on the same floor of your house and that you have an active Internet connection. Plug the PLE400 into the power outlet. QUICK TIP: If possible, connect the powerline adapters directly to a wall power outlet, and not to an extension cord, power strip, or surge protector. If a powerline adapter must be installed onto a power strip, make sure that no other electronic devices are connected to the same power strip. NOTE: Ensure that the PLE400’s Power LED is lit. Also, make sure that the Powerline LED is lit. It will continue flashing until it connects to a second powerline adapter. Connect the PLE400 to one of the numbered ports of your router using an Ethernet cable. NOTE: Make sure that the Ethernet LED corresponding to the Ethernet port where the PLE400 is connected on the router is lit. Connect the PLW400 into a power outlet. NOTE: Ensure that the PLW400’s Power LED is lit. Also, make sure that the PLE400 and PLW400 adapters are connected on the same circuit breaker. Make sure that the Powerline LEDs of both PLE400 and PLW400 are lit solidly. This indicates that the connection between the powerline adapters has been established. If one of the Powerline LEDs is not lit, click here. Connect the PLW400 to the router wirelessly. For detailed instructions, click here. 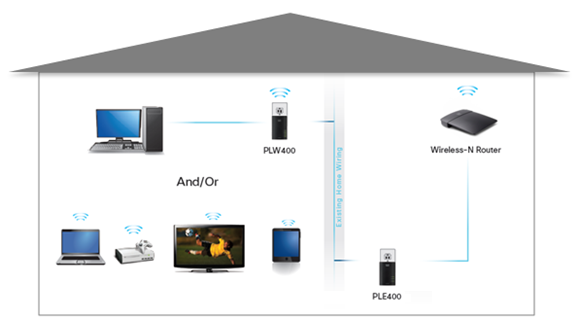 Connect your wireless devices to the PLW400. To learn how to connect wireless computers to your network, click here. QUICK TIP: If possible, position the PLW400 near the wireless devices that you want to connect. Also, avoid obstructions such as metal file cabinets, mirrors, and thick walls between the PLW400 and any wireless device that you want to connect to avoid connection problems. You should have successfully set up a wireless network with the PLWK400 now.